Home > Shop By Brand > McKee's 37 Waxes, Compounds, Coatings > McKee's 37 Trademark Extender Spray Wax 128 oz. McKee's 37 Trademark Extender Spray Wax is a polymer-infused, synthetic spray wax formula designed to enhance shine, extend your already existing paint protection, and provide a slick and shining finish that is resistant to dirt and dust build up. Perfect for use on all exterior surfaces, include paint, wheels, glass, chrome, and plastic trim, McKee's 37 Trademark Extender Spray Wax complements all colors and is very easy to apply! Spray waxes are lauded for their easy to apply formula, convenience, and multi-use functionality – and McKee's 37 Trademark Extender Spray Wax is no exception! Using a proprietary blend of slick polymers, McKee's 37 Trademark Extender Spray Wax creates an intense shine on all exterior surfaces in just one application. McKee's 37 Trademark Extender Spray Wax, while building an intense shine on your vehicle's surface, also supplies a layer of protection that is resistant to dirt and dust build-up. 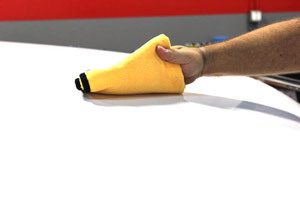 As the name implies, McKee's 37 Trademark Extender Spray Wax will extend the life of your existing paint protection. This includes all waxes and paint sealants! McKee's 37 Trademark Extender Spray Wax is a spray on and wipe off layer of intense shine and protection! Formulated here in the hot, humid climate of south Florida, McKee's 37 Trademark Extender Spray Wax will not streak, smear, or smudge – even when used in direct sunlight! Being both easy to use and imparting a great finish and layer of protection is the pinnacle of every spray wax and McKee's 37 Trademark Extender Spray Wax certainly measures up! For best results, apply McKee's 37 Trademark Extender Spray Wax onto a freshly washed and dried vehicle. Shake well. Working one panel at a time, spray directly onto surface.